Review excerpted from Philip Gardner’s Oberon’s Grove, 2016. Thursday April 14th, 2016 – Celebrating their 90th anniversary, The Martha Graham Dance Company opened their season at City Center with a program that featured two Graham masterpieces, a world premiere, and a powerful Mats Ek duet originally created for film. The Mannes Orchestra under the baton of David Hayes provided live music for the two Graham works. And the dancing was magnificent. NIGHT JOURNEY, Martha Graham’s telling of the Oedipus story as a flashback in the mind of Queen Jocasta in her final moments of life, premiered in 1947. William Schuman wrote the score, which is atmospheric and rhythmically inspired by the twists and turns in the narrative. 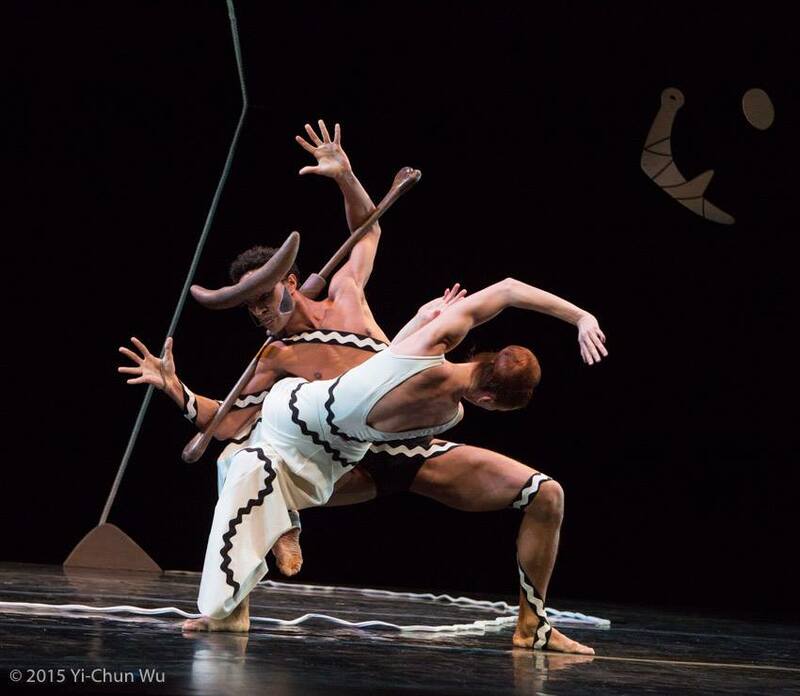 The Isamu Noguchi set, and the costuming (Martha Graham’s designs), create a sense of timeless drama. Although Blakeley White-McGuire made a gorgeous ‘Company farewell’ performance last February, goddesses have the power to disappear and reappear at will. When Nir Arieli and I stopped in to watch a rehearsal last week, Blakeley was there, sportingly holding down a spot in the ‘chorus’ and looking radiant as ever. “Something’s up!”, I thought. You can’t imagine how happy I was to find the White-McGuire name listed for Jocasta tonight. Her performance was a marvel in every respect: Blakeley’s supple strength, her Olympic-athlete physique, her intrinsic sense of character and of dramatic nuance, and the compelling surety of her dancing produced a glorious personification of the tragic Jocasta. One of the most distinctive beauties in the history of dance, Blakeley’s performance held us enthralled from start to finish; the wave of cheers that greeted her solo bow was so genuinely deserved. Surely she could feel the love pouring across the footlights. “Like the fascinating Arch Lauterer scenic designs for “Letter,” those by Isamu Noguchi for Graham’s 1947 “Errand into the Maze” were damaged by superstorm Sandy in 2012. This season marked the first time since then that the work could be performed with its full-scale Noguchi elements. The performance I saw was graced not only by a fine remake of Noguchi’s spare, space-enhancing scenic pieces, but also by the appropriately keen, dramatic and nuanced performing of Blakeley White-McGuire and Abdiel Jacobsen, as the nameless individuals who suggest Ariadne and the Minotaur in Graham’s take on the mythological tale of the labyrinth. In the role of the woman, originally Graham herself, confronting her fears as if hunted and haunted by the bestial, horned male figure pursuing her, Ms. White-McGuire gave a portrayal of individuality and distinction.